Why is it important to connect to nature in darkness? My fascination with connecting to ourselves, our own darkness, each other and nature in darkness has been a driving curiosity in my life for the last year. Before I begin I wanted to thank Clark Strand, Bill Plotkins and Lucy P. Pearce for helping connect the pieces with in me. Discovering the natural worlds ability to mirror so perfectly my life and what I came here to give. It’s where we come from and where we return to. We long for darkness. It’s part of our journey, our process, our way of being. It’s our darkness and the literal darkness of the night that shapes and creates who we are. We have always searched for home. We are home within the darkness because the darkness represents potential, growth and transformation. Our first home was our mother's womb and it is the dark womb of the world that we will return to. It is in darkness that we find our home. It where the question, what is to become of us?, is waiting there in the dark and it is in the darkness, in our darkness that we find all the answers we seek. The darkness does the thinking for us when let it. 2. In our modern paradigm, darkness equals death. We spend our whole lives fleeing from death. We know nobody exists this reality without dying it and yet we are so fearful of what is within the dark unknown. By avoiding it, by turning away, we become more fearful of it. What we learn by pushing our understanding of darkness is that in fact it isn’t dark at all. There is a galaxy of stars moving about the sky. There is a moon, showing us her different sides. And what we find is that the subtler lights are our guides. Let there be darkness or I can see my light and the true light in the world. 3. 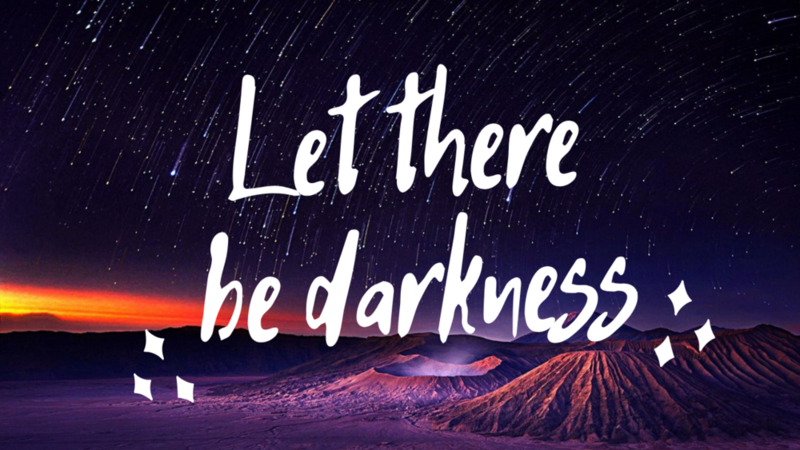 Darkness is a place where we face who we are, without labels, names or sight. Who are we without our form? What is the world without our sight? Our struggle for identity falls away and for who we are falls away. That’s not to say that fears don’t come up, they do -- our fear of being found out, our fear of rejection, our fear of judgement, our fear of pain but the beauty is that while this is where those fears dwell it is also where the darkness itself makes sense of it for us. Darkness is our most powerful balancer. How much time do you spend in darkness, after sunset, with no artificial light yet awake and conscious? Since the invention of artificial light the amount of time we spend awake in darkness is close to none. We all seek that one practice, that one person, or that one place that will provide us with the fountain of youth. With continued purpose and happiness within everyday life. What you seek is waiting for you in the dark. All you have to do is turn off your lights and go outside. There is a world out there waiting for you, your world is waiting. It’s waiting for you to show up, for you to discover who you are, for you to transform and for you to live a purposeful and fulfilled life, everyday for the rest of your life. 5. Stepping into new territory. Our experiences and understanding of darkness were likely feed to us as children. And those fears of what is lurking in the dark follow us all throughout our adult lives. When we are without our sense of sight, in a traditional sense, our other senses are wide out. We are more vulnerable and open in darkness and our ability to remember is heightened in darkness. While it can scary to step into the shadow, it is also exhilarating. You are entering into a new phase of a world you know, a place that is home and if you don’t know it yet you will soon. Once you descend into darkness and discover all that you are you will no longer live in fear of your brightness and all the ways you will shine into the world. 6. Connecting to nature in darkness is an ancient way of being. It wasn’t separated from their lives. Why? Because the only light they had was fire. They lived and breathed in both the daylight and nighttime. The stars and nighttime sky was where we looked to for direction, both literally and figuratively in terms of finding meaning in our lives. We don’t look to the stars for our gps anymore but the fact that it is the best place to discover and rediscover our purpose and why we are here will always remain. There were reasons our ancestors lived the way they did and it’s time to reconnect to the knowledge of our ancestors. 8. Darkness is your greatest teacher. What you find is that your challenges are not your own. The challenges each of us face have been past down from generation to generation. It’s time for you to wake up and do your part. It’s time to embody the richness you came here with. The lessons that will propel you into a greater sense of purpose and clarity with your life are found within the darkness, the teacher. 14. The best time for meditation is at night, in the dark. Next time before bed why not gift yourself 20 minutes of meditation in the dark before bed. You won’t know until you try. 15. Why are you afraid of the dark? For most people being afraid of the dark is a fear of being alone. But why are we so afraid of ourselves? We are afraid of our power, of what we are capable of. It is within the darkness we are overcome our fear of being alone, ironic I know but we must step into our fear in order to overcome it. 17. You don’t need to prove yourself. The more intentional and conscious darkness we have in our lives, we might be able to wake up to the question of, What on Earth have we done? And how might we go about finding a solution? In the dark we recover our simple humanness. In the dark we remember how to live and the interconnectedness of all of our lives. 20. Is it possible to forget what the land remembers? Is it possible to forget someone the land remembers? Is it possible for the stones, trees and rivers to forget the beings that shaped who they are? The beings that thought about their presence in the world? The beings that rested their backs against the trees? Or played in the water? The land doesn’t forget us. The land remembers our ancestors and it remembers you.